The thirty-seven works of art, twenty-four in full color, presented in A Piece of My Heart/Pedacito de mi Corazón take us into the heart of one of the most distinguished painters of Chicano life. In a career that spans twenty years, Carmen Lomas Garza has depicted the cherished traditions and harsh struggles of Chicano culture. From Grandparents Cutting Cactus to Felino’s Breakdancers, Lomas Garza’s bright, colorful images capture the beauty and texture of daily life among families, friends, and neighbors in southern Texas. Carmen Lomas Garza is the first Chicana to be the subject of a major traveling retrospective;The artist came of age during the Chicano civil rights movement of the late 1960s and early 1970s and El Movimiento helped shape her identity and goals. 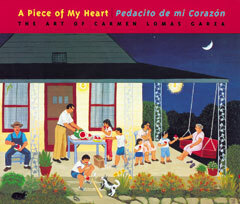 Lomas Garza’s evocative portraits of faith healings and tamale-making parties, of girls fixing their hair, and children gazing at the moon add a distinctly female perspective to her male compatriots’ earnest depictions of the oppressive living conditions of Chicanos. A Piece of My Heart/Pedacito de mi Corazón presents the artist’s finest works, including paintings, etchings, cut-paper hangings, and altarlike installations. Together with a biographical chronology and rich interpretive essay by Amalia Mesa-Bains, this book is a long-overdue introduction to an important artist.